You won't find many cross necklaces on my site or very much work involving other religious symbols either. 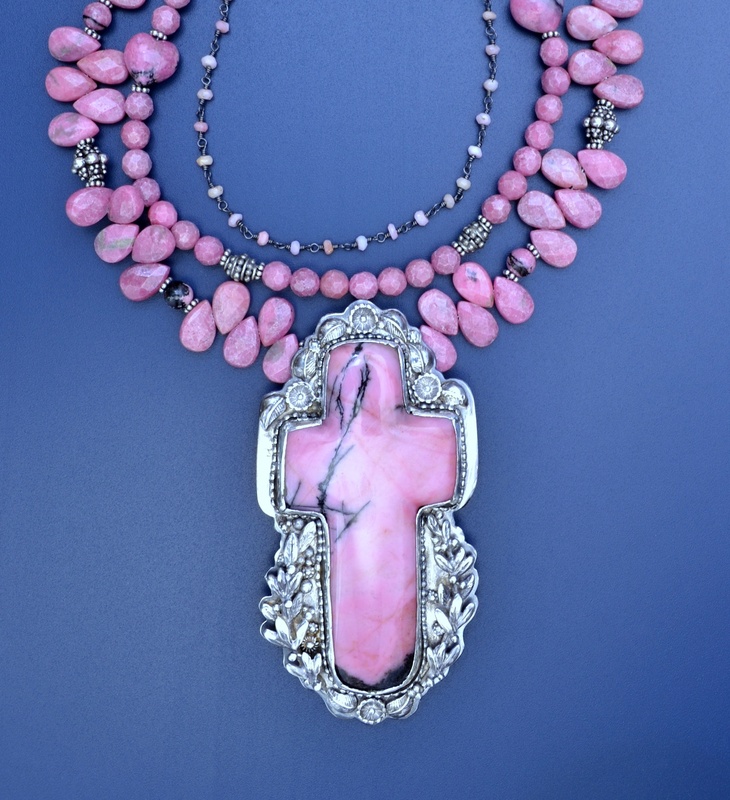 Even though the cross is extremely popular in Southwest jewelry and stone crosses are available by the gross, I only use powerful spiritual symbols when the item calls out to me as this gorgeous cross did. 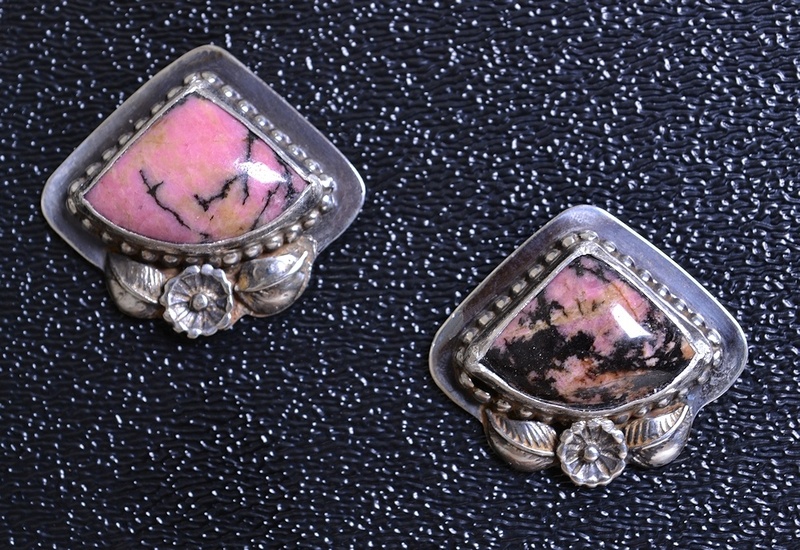 Rhodonite is a fascinating choice for a cross as Ahsian says that it "helps one to understand one's purpose, as revealed by one's gifts or abilities ... and to perfect them for the highest good." It is certainly helping me understand the limits of my abilities insofar as I made a beautiful pair of earrings to go with the cross using matching stones but didn't like the way they were hanging. So I promptly ruined the settings by trying to fix them in a hurry. I have now re-made the settings from scratch thus I hope having my skills increasingly perfected toward the highest good. When you study this cross, you will find that it isn't perfectly symmetrical. 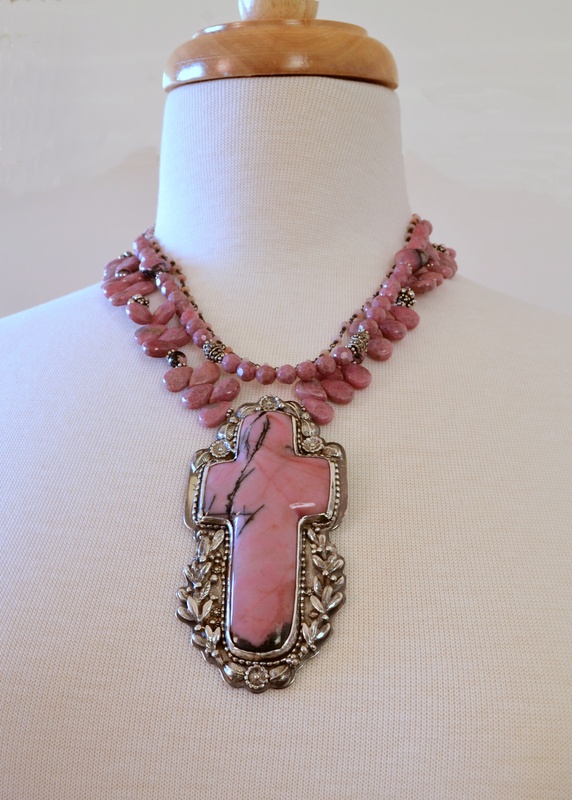 Unlike those bulk stone crosses (many of which are machine-made of extruded plasticized "stone"), this one was painstakingly cut by hand from a clear pink stone with just enough wispy black features to specify it as rhodonite. The high-quality material has taken a beautiful polish. While the cross has been adopted by Christianity as its primary symbol, its history dates back into antiquity. We can't begin to uncover the layers of meaning in this short essay, but perhaps we can consider one aspect. I was raised with a Merriam Webster view that eternity is "a state that comes after death and never ends," basically I thought that eternity means a really long time and further, that there is no way to participate in eternity until after death. My own teacher (whose books I've shown below) understood eternity very differently. He taught that the cross is the intersection between eternity (vertical axis) and time (horizontal axis), hence eternity is orthogonal to time, not measured by it. Don Juan showed a similar understanding with his stunning statement to Carlos in Tales of Power, "I'm going to utter perhaps the greatest piece of knowledge anyone can voice. Let me see what you can do with it. Do you know that at this very moment you are surrounded by eternity? ... There! Eternity is there! All around!... Do you know that one moment can be eternity? This is not a riddle; it's a fact..." Now I don't want to get into an argument about whether or not don Juan is a purely fictional character (as many scholars believe). If he was a fiction, it appears Castaneda did his homework in Biblical, Taoist and Advaita thought. Reading Tales of Power along with I Am That by Sri Nisargadatta Maharaj so many years ago convinced me they were pointing to the same truth through their highly disparate language. The very uniqueness of don Juan's language and descriptions led me to believe his might be an authentic understanding realized in a dramatically different cultural context. But to get back to the cross, if my teacher is correct, the cross reminds us we are always situated at the intersection of eternity and time, NOW. 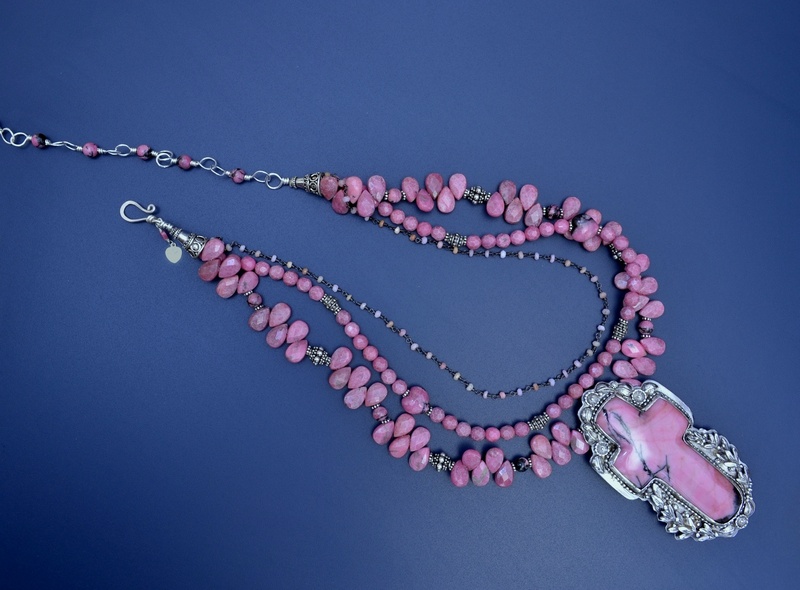 Whether you love pink, admire Southwest style, follow a particular religious doctrine or seek "eternity in an hour," I hope this necklace will bring you great joy and opportunity for contemplation.